Tune of the Day – 10 April. Nice and easy start into the week as Scottie Deep and MK’s Say Ahh! 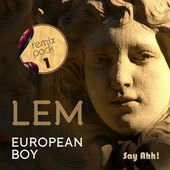 Records release the remix pack of ‘European Boy’ by LEM (Springsteen) of Mood II Swing fame, enlisting the services of household names from the ‘90s house era, LEM and Frankie Knuckles, as well as rising talents Oli Furness and DJ E-Clyps. Up first is Chicago’s Frankie Knuckles with his ‘Director’s Cut’ interpretation, opting to create fresh elements and rip snippets of the original vocal, Knuckles works in 909 drums and a timeless arp line alongside an acid tinged bass hook resulting in an effortlessly retro composition. Oli Furness stamps his raw analogue sound on the original with heavily swung snares, hi-hat rolls and looped vocal cuts intricately delayed to create an entirely new groove before creeping in a tweaky acid hook that oozes peak time energy. DJ E-Clyps, most notably known for his work on Todd Terry’s In House Records, creates a deep soulful rework, centered around rich melodies, showing the more heartfelt musical approach of the label to accompany the powerful 4:4 cuts already featured. Closing the release is LEM’s ‘Radio Mix’ of the original piece, pulling in veteran singer Jamelle ‘Tara’ Jones who has worked across the board on hip hop, soul and pop records for many years adds that vintage spice to the record. Out 24th April.